Royal Signals Museum - A011 On 9th June A011 at the Royal Signals Museum will commemorate the White Helmets Motorcycle Display team, who are disbanding. Motorcycles were used extensively by the Royal Signals as courier transport. There will be a new logo on the Union Flag only and this will run until the stamp is replaced with the Poppy Stamp. HMS Trincomalee Museum - A006 On 16th June A006 at the HMS Trincomalee Museum will celebrate the 200th year of the ship with an overprint on both stamps. This will run until October when the underprint will change to mark the ship's launch. Also HMS Caroline in Belfast will reopen on 1 July 2017 and machine A008 will recommence operations. Royal Mail will have also a machine at Midpex on 8 July. No further details available. The Fleet Air Arm Museum, based at RNAS Yeovilton near Ilchester, Somerset, is delighted to announce the launch of a new exhibition from the 19 July, entitled ‘Cold War to Kabul’. The inscriptions will run until 21 August. To mark the exhibition, the Museum in Partnership with Royal Mail, will launch two overprints from its Post and Go kiosk (A003), which feature prominent airframes Sea King HC4 (ZA298) and Harrier GR9 (ZD433). The kiosk will overprint ‘ZA298’ onto the Machin design and also ‘ZD433’ to the Union Jack design. 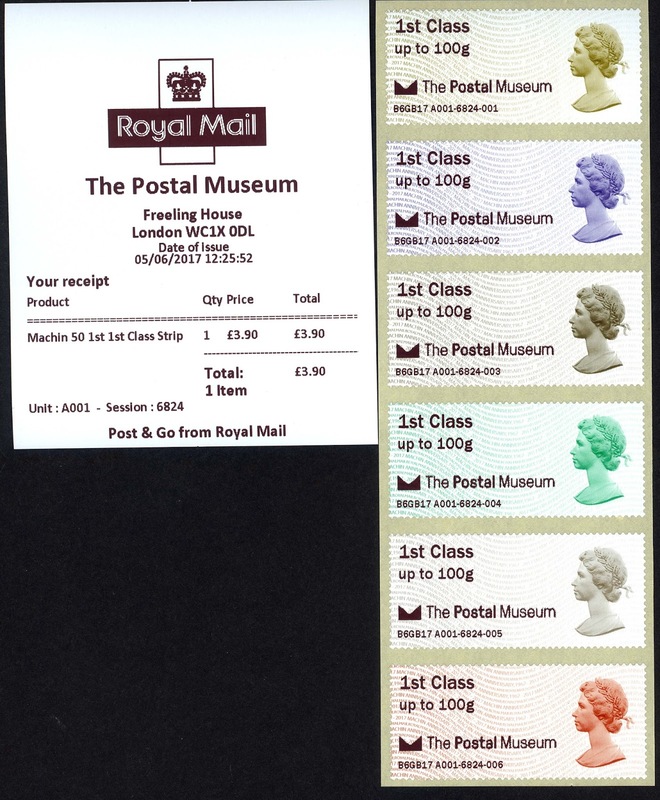 If you buy stamps you are entitled to visit the Museum and can claim a 25% reduction on individual ticket prices when you purchase stamps from the kiosk. For the duration of the overprint the Museum will offer a discount to all kiosk users. Simply show your stamps or receipt to Museum staff when purchasing tickets. UPDATE later the same day. After comment from 'Anonymous' and much searching, I have tracked down that machine M007 which is at one of Royal Mail's HQ offices, the one at 100 Victoria Embankment London EC4Y 0HQ. The machine has previously been used at political Party Conferences and now has the added inscription Royal Mail HQ, as shown below. 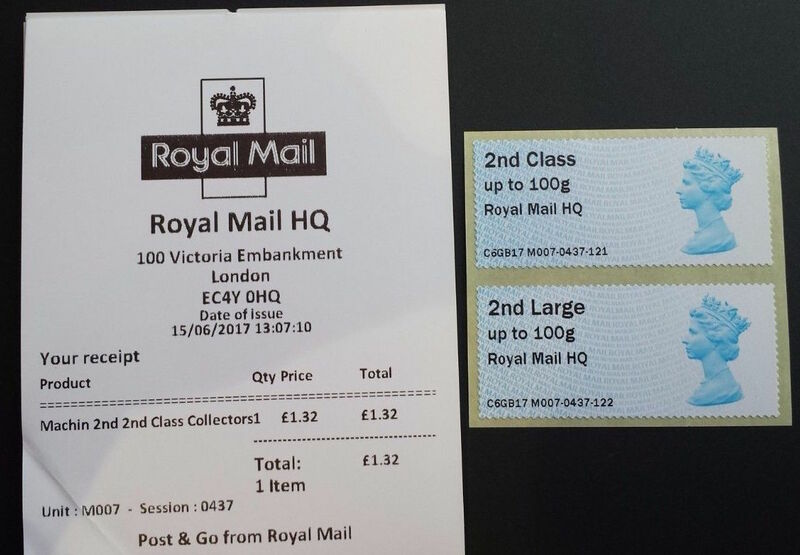 The items found on eBay are dated 15/06/2017 - the 2nd class are MA12 and the 1st class are MA13. Sellers are *timbromaniac* and makhonman2015. Thanks to Chris for sending in this picture of the new Royal Signals Museum Union Flag Post and Go stamps with the White Helmets (motorcycle display team) inscription and logo. Royal Mail HQ also now has a machine see that as a listing on Ebay. 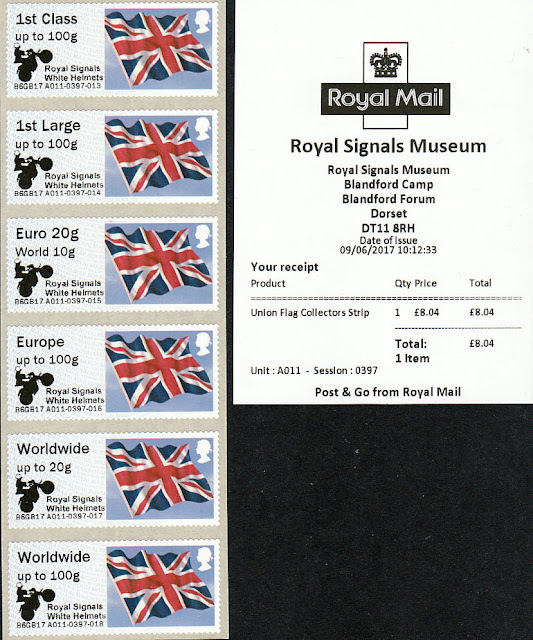 1st & 2nd class collectors strips. Thank you anonymous: if you have any other news, then the eBay item number would be useful, likewise the machine number. It makes it so much easier to find. I've only just found it which is why I have held your comment back for 6 hours while I try to work out what you are writing about! Is there any news of the October Trincomalee overprint possibly out today in view of Internetstamps sponsored pmk and Post & Go stamp on their cover? I only look at Royal Mail's webpage for news, and of course that is unchanged for months. 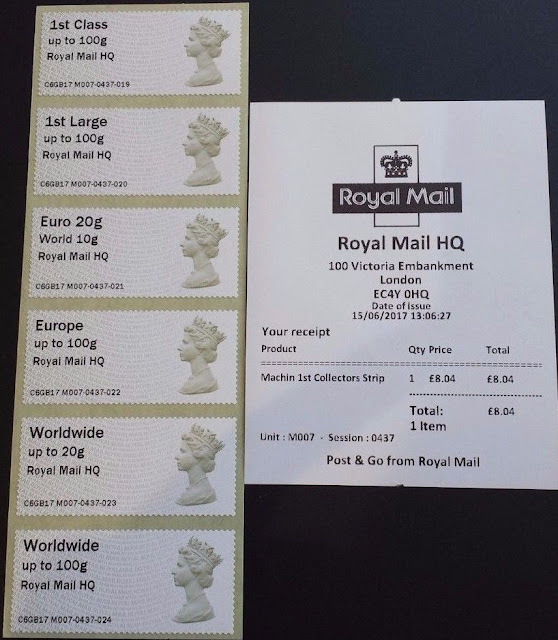 At the Stampex briefing they said that there would be more timely information - next year.